The 15-inch Samsung RC510-S03UK laptop shows off exactly what Intel's Core i3 performance beast of a chip is capable of. It's also reasonably priced – you can currently find one for around £580. It's pretty, too, with glossy fingerprint-magnet finish and a profile which makes it look much thinner than it actually is – a trick the MacBook Air has perfected and one the RC510 pulls off well. The overall look is certainly a step up from Samsung's previous laptop range, which only sidestepped the generic tag thanks to a couple of well-placed curves. Equipped with the Nvidia Optimus GeForce 315M GPU chip and a full gigabyte of video memory, its specification certainly promises a lot. We can safely predict that the Core i3 is going to do enough to keep it competitive, but is this that rare beast: a mid-range 3D laptop powerhouse? There are several versions of the RC510 out there, but we tested the RC510-S03UK, which features the Core i3 processor. You might find it listed with a Core i5 – it certainly seems to be a widespread specification – but that seems to be an erroneous listing. Check thoroughly before buying. Intel's Core i3 has changed the way things work in the laptop market. The chip comes in at a low-end price but offers the sort of performance you might expect from a much more expensive processor. So much so that it could be stealing business from machines that feature i5 and i7 processors. Who needs the best when something that should logically be rubbish is actually brilliant? We reckon Intel could be doing itself out of more lucrative business, but as tech enthusiasts first and foremost we can't complain about brilliance being placed within every man's reach. The Samsung RC510 also features Nvidia's Optimus tech, which promises the ultimate compromise between battery life and performance by dialling up the RC510's graphical performance only when it's needed. 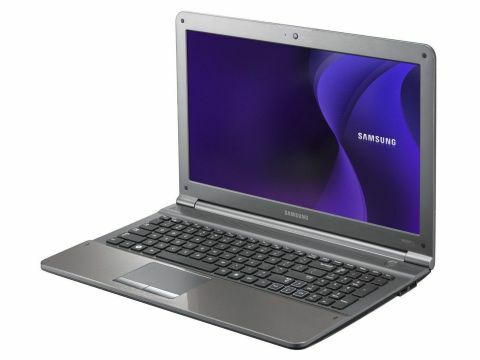 The mobile version of the GeForce 315 provides the pixel-shifting grunt, and with 6GB RAM on board (and the requisite 64-bit version of Windows 7 Home Premium to handle it) it's clear that Samsung has attempted to make this the strongest machine it can for the price. Aesthetically it's rather pleasing; the ports are well spread on the left and right of the case, with a pair of USB connectors available on each, and the speakers are tucked into a single grille at the rear of the keyboard. The keyboard itself is 'Island style', which means it's a chiclet keyboard with big gaps between the keys. This is supposed to reduce typos, and we can say from our own clumsy perspective that it seems to work. It certainly looks good, if that's what you're worried about. Samsung has also managed to include a number pad without completely screwing up the main keyboard layout. The right arrow key nestles next to the '0' and the number pad keys appear slightly narrower than those of the main keyboard, but these aren't huge concessions as far as such rearrangements go. There's a gigantic multi-touch trackpad in the middle of the main keyboard (so slightly off-centre) with distinct buttons and a texture mercifully more matte than the glossy lacquer of the wrist-rest. There's nothing worse than a glossy track pad, after all. Rounding out the package there's a 15.6-inch LED-driven widescreen panel, which Samsung claims is SuperBright. We can attest that, when turned up to full brightness, it's a little brutal on the retinas. You'll probably keep it around mid-way if you value your eyesight.